Mac (centre) and Chance working sheep in the long dry grass last summer. 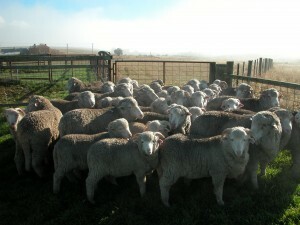 Sheep going into the farthest back paddock a couple of weeks ago. Not without some drama, I managed to get all my sheep from the farthest point on the property, back into the remaining green areas near the woolshed, where I was confident they could be protected from fire. And then I remembered that about this time last year, I wrote the very first Yarn (thinking, silly me, that the website was not far away from completion). It was entitled “Fire Weather—Annie and Jem”). Here it is. “Tonight, as the wind dropped from a hot, dry, gusty northerly to a gentle evening breeze, I went to let the sheep out of their fire muster station—the 2 acres or so behind the woolshed. It’s a drainage between two waterholes, and has a lovely stand of mixed grasses and exotic forbs—broad-leafed plants. (It's the area where Alice the sheep taught me to appreciate nutritional wisdom.) It also has a brand-new concrete trough, installed after the really bad fire day on January 4th (2013) when a fair bit of Tasmania was either alight, or in danger of it. Still, 900 sheep in 2 acres—they were definitely ready to leave. I drove over in the Polaris buggy—not too far to walk, but I was in my pyjamas and flip-flops, and feeling the effects of a long, hot day. The first sheep out the gate was one of my twin pet lambs—now a mother twice over herself. Anne, I called her, after Anne of Green Gables, and Emily is her twin, after another orphaned heroine from L.M. Montgomery. Inevitably, they became Annie and Emmie, though I’m sure their namesakes would have objected at the nicknames. The year they were born was the first year that I really began to understand the responsibilities of a mother sheep, and I was quite anxious about teaching them to eat properly. In the end, I just took them for walks—through that same little paddock behind the woolshed, stopping whenever I found an interesting plant for them to try. They must have just assumed that I was eating it, and followed suit. By the time they went back to the flock, they were eating (and relishing) over a dozen different plants: 3 or 4 species of grass (least favorite), chicory, plantain, lucerne, several different types of clover, milkweed, dandelions, willow. A year or so later, I watched Annie lead the rest of the flock into a patch of roadside mignonette—a “noxious” weed previously unknown to any of them, and give it a try. Nutrition research has shown that the more plants an individual animal learns to eat, the more likely it is for that animal to try something new. I was very proud of Annie. But back to fire weather. Annie came out of the gate, and over to me for her ritual sniff. I always reach out to pet her, and she always ducks. I had somehow concluded that she didn’t have a lamb this year, but right beside her was a beautiful little ram lamb. He was too skittish to come near, but I got a close enough look to be able to identify him when we take the ram lambs out of the flock soon—the only lambs to get weaned. His ear tag was sadly askew, and he has a very distinctive light coloured band on his near horn—I will know him when I see him again, and once I have his ear tag number, he’ll become another of the handful of sheep with names that don’t ever get sold. I think I’ll call him Jem. Annie and Jem walked up the lane a little way with me, leading the other 888 sheep into the “long paddock”—my tongue-in-cheek name for a kilometer-long stretch of laneway leading out to the runs. They’ll spend the night there, and after it starts to rain at dawn, stockman Davey will take them back to the Basin—150 acres of mixed native and exotic pastures that has been resting for the last 5 weeks, ready to be grazed again by Annie’s friends and relations. Fuel-filled back country earlier this month. And, fingers crossed, last Sunday will be the last real day of fire weather for 2014. 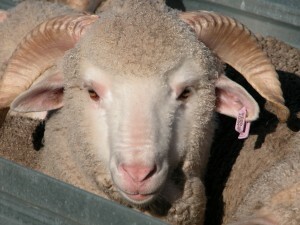 Oh, and Jem is now part of 10-strong ram flock, so he’ll be with us for the next 5 years or so. Well, actually, since any sheep that has a name gets to live out their years in comfort here, with any luck he’ll be with us for a long time. 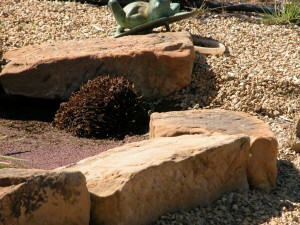 An echidna about to discover he CAN swim–in my ornamental fish pond, on a very hot, very dry day a couple of weeks ago.